The Script inspector features the most important controls to adjust your script's appearance. Where it makes sense a reset button is available to reset the respective property to its default. The controls of the first group allow you to change the script background color, the text color and the font face. The ø buttons next to each control restore the default value. So if you want to get rid of that ugly pink text color just press the ø button and you're back to the default text color. Text alignment can aso be set. This setting will pre-set a default value for newly created teleprompter windows. It won't change the alignment of existing teleprompters though to not change your existing teleprompter arrangement. Use the Display inspector (or the teleprompter windows directly) to change text alignment for existing teleprompter windows. These controls focus on the script background image. You can choose to display a background image behind the scrolling text. For best results the image should be visible only lightly which you can adjust with the opacity slider. The background image you set here will be embedded in the script file when you save it. So watch out to not set a too large image as this could blow up your script file's size to multiple megabytes. This group focuses on text flipping. You can simulate how the script will look when it's flipped (for example to use a mirror system). As with the text alignment setting this won't affect existing teleprompter windows but just set a default value for newly spawned windows. 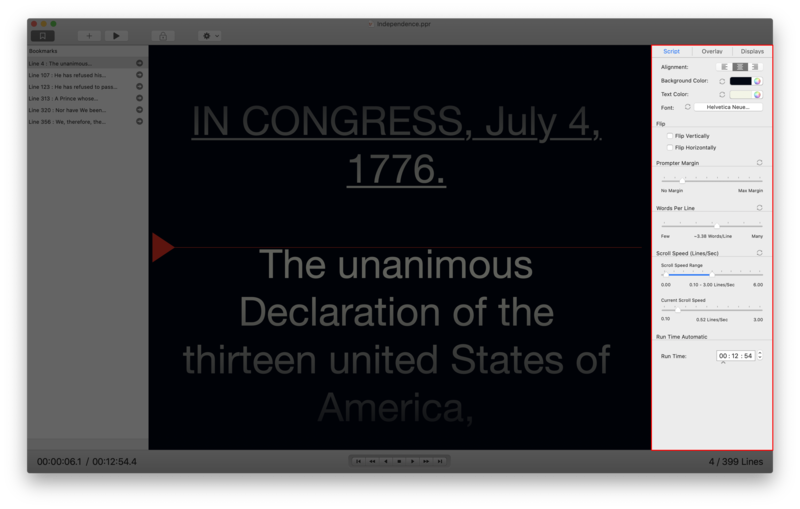 Prompter Margin and Words per Line control the number of words in a line (and indirectly the font size). Most people are comfortable with roughly 4 to 6 words per line and no prompter margin (empty space left/right around the text). 💡️ Hint: If you want to increase font size just decrease the number of words per line. Power Prompter then automatically adjusts font size to fit this requirement. This might sound backwards to you at first but this behavior is required to make the text look exactly the same on all attached displays which can have different resolutions. The final two control groups center around scroll speed. You can either adjust the scroll speed manually via the slider or you can let the computer set a scroll speed based on the script's desired runtime. Please note that margin and word/line count affect the total runtime so make sure you have set up your desired word count before adjusting the run time. 💡️ You can reset most of the settings to a "factory default" by pressing the Reset button next to the control group's title. 💡️ Power Prompter remembers the values you set here and will use them as default for new scripts you create. So if you have found a favorite margin setting Power Prompter will use that until you change it". 💡 Inspector adjustments generally are not included in the undo/redo chain. So you won't be able to undo a margin change via Edit Undo for example. You will have to manually move the slider to its previous position.